Want to get into space? Heck – who doesn’t! In the early days of space exploration the vehicles were the equivalent of experimental coupes with no room in the back. Rockets like the Saturn V had a lot of power under the hood, but the capsule had no seats for the kids or friends. Kudos to Virgin Galactic for taking the next step, with vehicles for up to six passengers. These lucky six will be paying anywhere from US$95,000 to US$250,000 depending on the length of the journey. This upgrades us from two-seater to an Orbital Minivan, but really this is still only an extreme sport for the super wealthy. Maybe not the spouse in the passenger seat and kids in the back — more like the CEO and his lucky executives. True space tourism would be closer to the model we have today with commercial aviation, opening up the unique travel and leisure opportunities for a wider population. That would require something akin to a tourist bus. 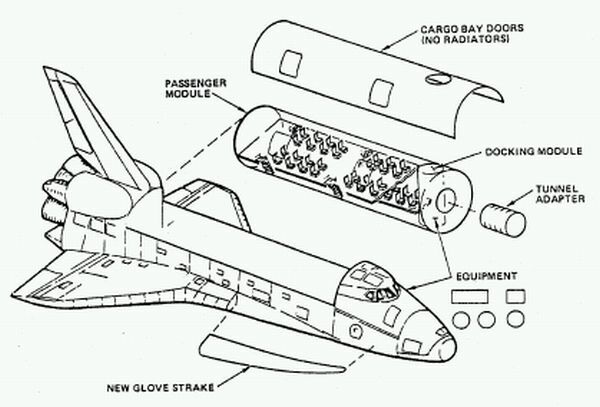 Interestingly, the designers of the Space Shuttle originally intended it to be used as far more than a cargo carrier, with some designs carrying up to 74 passengers in a modified rear compartment or ‘passenger module’. Check out the graphic below (attribution: chron.com blog). Even more fascinating is the fact that the Shuttle was also originally conceived with a reusable manned booster. The problem was the manned booster was about the size of an aircraft carrier. Yet if they had managed to build it, the overall cost of spaceflight might have dropped substantially, taking advantage of the fact that the fuel is only about 1% of the cost of getting into orbit. It is interesting to note that the development of reusable boosters (unmanned), is the key focus of Space X for this exact reason (i.e. that the hardware is where the real cost is, not the fuel).